I read this article and found it very interesting, thought it might be something for you. The article is called Redefining Normal and is located at http://www.outsmartmagazine.com/2012/05/redefining-normal/. 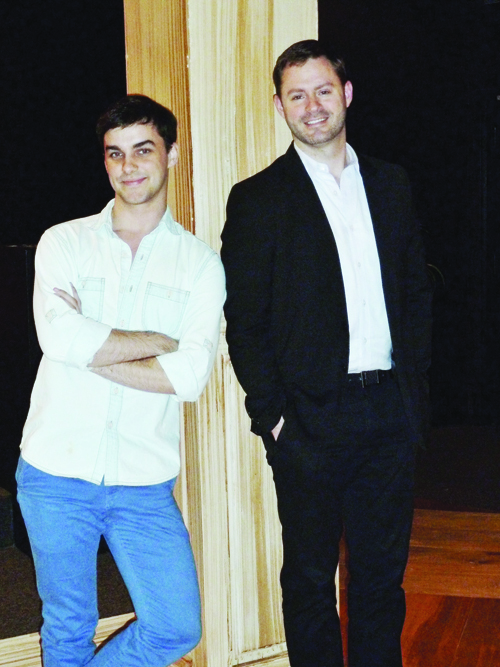 Taking it personally: Mark Ivy (l) and Brad Goertz get dysfunctional in Stages Repertory Theatre’s production of Brian Yorkey and Tom Kitt’s Next to Normal. Brad Goertz’s sister had passed away and his father was in ICU last fall when he landed the role of Dan, the husband of a woman who is bipolar and suicidal, in Next to Normal, opening this month at Stages. “Brad is very brave to tackle this role at this time,” comments Eva Laporte, who recently directed Goertz as a gay man who’s surprised to find himself falling for a guy he meets on Craigslist, in POST by Eric James. Show-people have been part of Goertz’s life since childhood—“much to my parents’ chagrin,” he says, although relieved that something about seeing him play Fagin in Oliver! in the 12th grade convinced his parents their son was an actor. Coming out to close friends at Klein High School in the ’90s wasn’t so bad, he says, “since I was part of the theater group. We tended to gravitate toward one another. Did I mention that Next to Normal is a musical, and a rock musical at that? It’s a far cry from musical comedy, although its rollercoaster aspect gives audiences opportunities to breathe, especially in charming moments of young love with Henry and Dan’s daughter, Natalie. “The loud moments happen just at the right times,” says Goertz. Ivy has moved home to Sugar Land after graduating last year from Sam Houston State University. That milestone also accompanied the breakup of his two-year relationship with his boyfriend, who moved home to Fort Worth. “I love the guy. It was amicable as we map out our futures as full-time adults,” he says. “But you see each other every day for two years, then not as frequently—it can do a number on you mentally. “It’s definitely cathartic,” says Goertz, who credits his partner of three years, Michael Walsh, a classical singer, for helping him deal with his family tragedies in a healthy way.